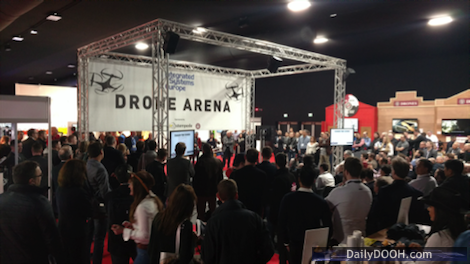 The ProAV industry’s largest drone exhibition is set to return to #ISE2018 as Stampede, the global leader in value-added distribution, will bring a larger and even more broadly focused Drone Pavilion to #ISE2018 at Stand #14-A100 in Hall 14 of the RAI Centre. According to Stampede President & COO Kevin Kelly, the 2018 Drone Pavilion will feature more models from more manufacturers demonstrating applications across a broader range of vertical markets. What’s more, Stampede will again team up with Unmanned Vehicle University to provide a full schedule of application-specific presentations and training sessions, as well as small group and one-on-one information sessions. The separate Unmanned Vehicle University classes will cover in-depth discussions of various commercial applications and how drones are being used currently – such as Public Safety, Infrastructure Inspection, Survey/Mapping and Aerial Cinematography implementations. The Stampede Fly Cage is one of the major attractions for show attendees. Throughout each day, the Stampede Fly Cage will host short presentations by specific drone-related manufacturers who will discuss in more detail how their specific models can be used to support commercial applications. Visitors to the Stampede Drone Pavilion will also have a chance to win a drone. In fact, one drone will be given away each day of the show. Show attendees can put their business card into the raffle drum, and they need not be present to win. This entry was posted on Tuesday, November 14th, 2017 at 14:39 @652 and is filed under DailyDOOH Update. You can follow any responses to this entry through the RSS 2.0 feed. You can leave a response, or trackback from your own site.